Filmed in the sub zero landscape, Assmann and Strijbos set up the conditions for the transmutation of matter, from a liquid to a solid state. This unique environment reveals in real time, the physical transformations seen only at the tipping point of matter, when it is pushed to the edge of its physical state. 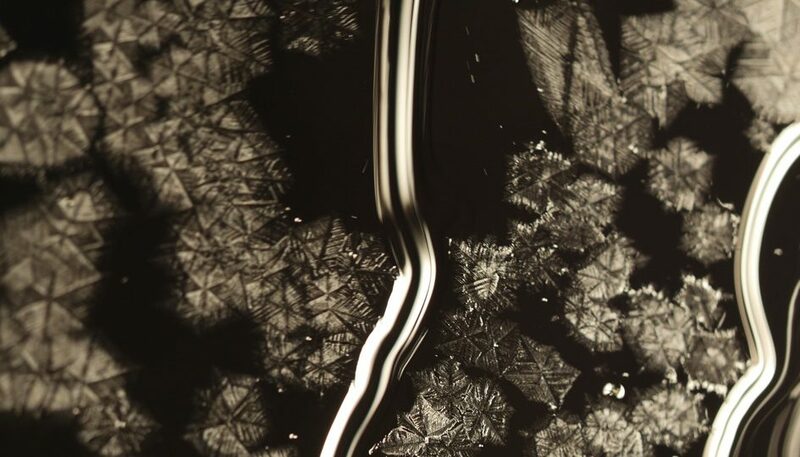 Liquid Solid (2015) is a collaborative project between Nicky Assmann and Joris Strijbos in which they explore the cinematic qualities of a freezing soap film created after attending the Ars BioArctica residency program at the Kilpisjärvi Biological Station of the University of Helsinki in the sub-Arctic region of Finland. The residency has an emphasis on the Arctic environment and art and science collaboration. Since weather conditions like wind and temperature varied each day, with temperatures ranging from minus 6 to minus 22 degrees Celsius, the freezing process differed in behaviour and appearance. The video installation Liquid Solid is an eighteen-minute-long, practically unedited registration of the freezing process of soap liquid. Soap only freezes at very low temperatures, because the water remains protected by the soap acids for a very long time. Within a number of minutes, the colourful soap slowly sinks down in the film of soap, until a vacuum of a very thin layer of water remains, in which frozen crystals whirl round. Only at a very low temperature, an accelerated freezing process occurs, during which ice crystals transform into fractal-like patterns. For both the video installation and the film Strijbos and Assmann composed a soundtrack with a mixture of soundscapes and recordings of self-made instruments, such as monochords played with electromagnets, which they developed in earlier collaborations. Joris Strijbos studied ArtScience at the Royal Academy of Art in The Hague where he earned his Bachelor degree and received his master degree at the Royal Conservatory of The Hague. His work has been widely shown at festivals, galleries and museums like, Ars Electronica, Linz, Sonic Acts Festival, Amsterdam, DEAF Biennale, Rotterdam, TodaysArt Festival,The Hague, Woodstreet Galleries, EYE Institute – Amsterdam, TENT Rotterdam, NCCA Moscow, amongst others. The immaterial and intangible character of light, colour and movement forms the starting point of Nicky Assmann’s [NL] spatial installations, in which she tries to heighten the perception. She combines artistic, scientific and cinematographic knowledge in experiments with physical processes aimed at sensorial interference, in the form of kinetic light installations, video’s and live audio visual performances. She embeds her work in a context of visual music, expanded cinema, and the concept of synaesthesia. Set against the backdrop of our visual culture, where the perception of reality increasingly occurs in the virtual domain, she returns to the physical foundations of seeing in which the embodied experience is central. Assmann has exhibited her work in a solo show at TENT Rotterdam and in group exhibitions at the Saatchi Gallery [London], National Taiwan Museum of Fine Arts, Wood Street Galleries [Pittsburgh], Art Rotterdam Week, Quartier 21 [Vienna], V2_Institute for the Unstable Media [Rotterdam], amongst other. In 2015 she was nomitated for the Prix de Rome and her work Solace gained an Honorary Mention in the 2011 StartPoint Prize. Assmann holds a Bachelor of Arts in Media & Culture [Film Science], University of Amsterdam and Master in ArtScience, Interfaculty, Royal Conservatory The Hague. She is part of the Macular art collective, which focuses on art, technology, science, and perception.